The MAN Group is one of Europe's leading manufacturers of commercial vehicles, engines and mechanical engineering equipment with annual revenue of approximately €14.7 billion and around 52.300 employees worldwide. MAN supplies trucks, buses, diesel engines and turbomachinery as well as turnkey power plants. MAN’s divisions hold leading positions in their respective markets. Munich-based MAN SE is one of the 30 leading companies in Germany's DAX equity index. The MAN Group's strategy aims to create sustainable value in Commercial Vehicles and Power Engineering, its fast-growing business areas. The Industrial Governance management system is a part of this. It clearly distributes roles, centralizing the company's strategic management and strengthening the operational responsibility of its three subgroups: MAN Truck & Bus, MAN Diesel & Turbo and MAN Latin America. Each division must measure itself against its strongest competitor. The MAN Group's Guiding Principles outline the scope for the responsible and sustainability-driven conduct of all MAN employees. Our Corporate Values of being reliable, innovative, dynamic and open play a key role in our success on both product markets and the capital markets as well as in attracting qualified employees and in social acceptance of all our business activities. PT Duta Putera Sumatera a wholly owned subsidiary of Sun Motor Group was established in1984 as Suzuki Motorcycle dealership in North Sumatera. 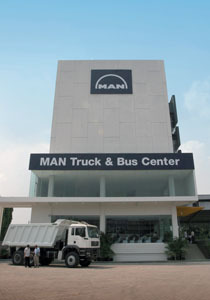 In 2008 the company was appointed as importer and sole distributor of MAN Truck & Bus in Indonesia. Currently the company operate five dealership in Jakarta, Medan Pekanbaru, Balikpapan and Samarinda and succesfully sold ... trucks during it's 2 years of existence. Sun Motor was born of a determination and perseverance of Mr. and Mrs. Sundoro Hosea in 1974 in Solo, Central Java. Under the name of UD Sun Motor, it was originally engaged in car loan business in several cities in Central Java. With tremendous spirit and hard work, this business has grown into a large network of car, truck, and motorcycle dealership. Sun Motor has also branched out into other business as well. Consistent with the professional values of persistence, integrity and focused effort, the couple nurtures Sun Motor and passes it on to their children. Currently Sun Motor is a leading Authorized Dealer for 6 brands with its 45 branches located across Indonesia's major cities, including Jakarta, Bandung, Semarang, Solo, Surabaya, and Denpasar. Sun Motor also has a special division that handles the sales of 5 brands motorcycle with 20 branches in various cities. From car and motorcycle dealerships, Sun Motor spreads its wings to property, finance and a car rental business. Novotel Hotel Solo, which was built in 1996, is a case of remarkable success story. It was followed by Grand Mercure Hotel Yogyakarta (2004, now The Phoenix Hotel), Novotel Hotel Semarang (2005), Ibis Hotel Solo (2008), Best Western Premier Solo launched in 2009, Sun Heritage-Kuta, Ibis Hotel-Kuta, All Seasons Hotel-Denpasar and several hotels under the brand Formula-1 in Jakarta, Semarang, Yogyakarta and Bali. Supported by more than 3,500 employees, Sun Motor strives to become a leading company in Indonesia and provide added value to its stakeholders.